n.b. I'm reorganising the blog, so if you can't find a particular post, use the search box. Introduction to our swim coach! Pre-season training for cycling and triathlon -2015 starts now! your christmas cycling training or damage limitation! motivation for endurance sports: what motivates high achieving people? click on the title to go to the post if you want to comment on it. This literature review looks at performance assessment methods in road cycling, what constitutes an optimal pacing strategy and whether performance models can predict real world performance and hence suggest an optimal pacing strategy. Due to the nature of training for road cycling, time trials and the cycling segment of a triathlon, coaches rarely work with athletes in person and as such rely heavily on data collected remotely to prescribe training. For the purpose of this review only field based performance assessment methods that can be applied remotely using power data are considered. Performance analysis aims to quantify exercise load, which is a product of intensity and time (Skiba and Clarke, 2013) and refers to the amount of training or ‘dose’ of training (Wallace et al., 2014). Intensity is usually defined by what training metrics are used: power (W), heart rate (HR), rate of perceived exertion (RPE). Generally coaches focus on the indirect inference of lactate threshold or other analogous phenomena, as the key value upon which to base their training prescriptions (intensity and time). Functional Threshold Power™ (FTP) (Peaksware Inc, Boulder, USA), or critical power (CP) (Monod and Scherrer, 1965) are metrics analogous with with power at lactate threshold, commonly used in the by cyclists and coaches. This literature review explores the ecological validity of FTP, CP and how these can be applied to pacing strategy. Pacing strategy is defined here as how an athlete distributes effort over the duration of a performance. From Abbiss and Laursen (2008), it is possible to identify the main pacing strategies pertinent to endurance cycling: variable or dynamic pacing (VP), where intensity is varied; even or linear pacing (EP), where effort is kept steady; negative pacing, where an athlete goes faster as the event progresses; positive pacing, where an athlete slows as the event progresses. Sustainable power is often measured through a self paced effort (SP) and used as a baseline in research. It is clear some argument exists as to whether variable pacing (VP), utilizing work rates above FTP or CP during longer effort constitutes a more effective pacing strategy than even paced (EP) efforts. From mathematical models of forces acting on a cyclist (Martin et al. 1998), it is possible to analyse the different force in different situations and what implications these will have on pacing strategy raising the following questions: Should pacing strategy vary depending on context? Are efforts not contemplated by CP or FTP relevant to pacing strategy? This review is broken into three main sections: pacing strategy, a mathematical examination of pacing strategy and performance analysis methods. While researching the reliability of laboratory based tests on pacing strategy, Thomas et al. (2013) found that despite high variance at the beginning and end of the test, lab TT efforts were reliable. Athletes adopted a parabolic-shaped pacing strategy for SP. For a 60 min effort where environmental conditions remain stable such as in a velodrome, or on an ergometer, Padilla et al. (2000) suggest, based on a mathematical model itself based case study of a specific 1 h world record attempt that an even pacing strategy is optimal due to less extra energy being expended through acceleration. Stable situations such as that in a velodrome are seldom encountered in normal road cycling. Thomas et al. (2012) examined the effect of EP, SP and VP strategies on cycling performance and found that EP caused the least amount physiological disturbance and lower perceived effort as measured through the 20 point Borg scale. For testing variable pacing, their design presented a 1:1.5 ratio of high intensity versus low intensity efforts, where those efforts equated to 142% and 72% of the mean value obtained in a simulated self paced 20 km time trial (TT) on an indoor ergometer. There is no mention why the values of 142% and 72% were chosen, although the total workload would equal that of SP precisely and was well tolerated by the participants in the study. EP power was set as the average for SP. The authors suggest EP might be optimal for endurance events based on lower perceived effort and smallest degree of physiological perturbation observed in their study. The authors themselves admit the need to investigate more ecologically valid models. Outside of the stated aims of the study, Thomas et al. (2012) found that for the self paced trial, participants adopted a fast start, or positive pacing strategy, however this might not be a so much a deliberate strategy, as the authors suggest as a decline in gross efficiency. Atkinson et al. (2007) similarly tested VP in a simulated hilly TT, set to work (800 kJ) and not distance, where power varied by +5% on uphill sections to -5% on downhill sections in relation to the average power established in self paced trial with the same amount of work. In this situation, uphill sections tended to be much longer (mean 714 s) in duration than downhill (190 s), inverse to the study by Thomas et al. (2010) with longer periods above mean power for SP. While this study did find a reduction in time to complete the task for five of the seven participants, it appear this strategy is not useful for all people. While no mention is made of how uphill sections are simulated and since only over all time for each section is given and work done is the same for both uphill and downhill sections, it can only assume that acceleration due to gravity on a slope is summed to the power produced by the cyclist, be it positive or negative. There is also no mention of how changes in air resistance are quantified. In assessing mean power in a self paced trial Atkinson et al. (2007) also observed participants tended to a positive pacing strategy. Abbiss et al. (2006) looked at pacing strategies employed in actual performances by well trained, experienced triathletes taking part in an Ironman triathlon. The key external variable affecting the athletes during the event was the wind and the authors found that the athletes tended to slight increase power output into the wind and that there was a greater variability in power output into a headwind, in line with what Swain (1997) proposes as optimal. Like observed in Atkinson et. al. (2007), the participants observed by Abbiss et. al. (2006) showed a positive pacing strategy with mean lap time increasing as they progressed. Johnson et al. (2013) looked at pacing strategy from the perspective of relative success in the Hawaii Ironman World Championships. Success was determined by the percentage difference between the prior goal of the competitor and the outcome. This definition of success is dependent on the subjective appraisal by participants of their goals. The researchers looked at the relative intensities of exercise for the cycling section using heart rate (HR) and found that the most successful athletes according to their definition produced a more even effort and sustained higher HR on descents and increasing intensity on the downhill. From this the authors conclude uphill sections should be approached with caution. None of the sections the authors analyzed were descent or ascent only. Sections were defined according to whether net descent was positive or negative, as such do not explicitly detail a specific type of geography, but rather net ascent over relatively long distances. Johnson et al. (2013) mention that the successful group adopted a slightly negative pacing strategy. Martin et al. (1998) produced a mathematical model for power while cycling, from which results highly correlated (R2 = .97) with actual values as measured with an SRM (SRM GMBH, Jülich, Germany) power meter and presented with a standard error of only 2.7 W. This model was reviewed by Debraux et al. (2011) and found in terms of aerodynamic drag to be accurate. The SRM power meter has itself been shown to be valid and reliable in laboratory and field tests (Nimmerichter et al. 2009). Ignoring factors such as rolling and mechanical resistance, accounted for by Martin et al. (1998), when the sum of these equations equal zero, we get an approximation of terminal velocity for a given slope. For a slop with -5% is approximately 16.01 m.s-1 where CdA is equal to 0.5 and rho is 1.266 kg/m3 and the weight of the cyclist and equipment is 80 kg. The same equation can be used to calculate the added speed of producing more force on a descent. As an illustration, a cyclist obeying the aforementioned characteristics, using the same equations with the same limitations producing an extra 300 w of power would travel at 18.23 m.s-1 versus 16.01 m.s-1 coasting, providing a time benefit of 6.7 sec per kilometer. This might not be the best use of effort: In real world scenarios, an equivalent increase in speed can be achieved through an aerodynamic tuck reducing frontal area potentially improving if drag coefficient remains constant or improves (Peterman et al., 2015). Swain (1997) found increasing effort on uphill segments and decreasing it on downhill segments to provide a benefit in time to completion, supporting these conclusions. From this equation it is possible to calculate time to reach a given terminal velocity. Ignoring factors such as the exponential increase in air resistance and the contribution by gravity, for a cyclist of the aforementioned characteristics acceleration to terminal velocity (18.23 m.s-1) for a power of 300 W on a -5% incline is 37.9 sec, whereas for the same cyclist producing 500 W it would require 22.7 sec. Average time savings over a 1000 m descent between 300 W acceleration and 500 W is 4.7 sec. Given the exponential increase in drag given velocity and constant acceleration due to gravity, more effort is best applied on uphill sections and less on downhill sections. These variations in effort also appear to be tolerated physiologically (Thomas et al. 2012). Between Atkinson et al. (2007) and Thomas et al. (2012) it seems clear that the magnitude and duration of intensities relative to mean power from a self paced test and the ratio of hard efforts to soft efforts have a great impact on what degree of variation can be tolerated. From the mathematical model proposed by Martin et al. (1998), it is possible to understand the implications of different intensities of effort at different point on a variable course. Sprinting at certain points on a variable course may be relevant to pacing strategy, if these efforts are well tolerate by the individual and exercise on the following section is below “anaerobic” threshold. None of the studies on pacing reviewed mention efforts deriving energy from the ATP-PC energy system, a factor that in real world scenarios might prove significant. Menaspà et al. (2015a), found that 12 sec sprint power was not affected by 12 min of prior variable and non-variable high intensity exercise, deemed to simulate the intensity of the finish of a cycling road race, hence the capacity of the system is unlikely to be impaired by a sustained high intensity effort of 12 min duration. Menaspà et al. (2015b) found in an experimental setting that neither 10 min of variable high intensity exercise or constant high intensity exercise impaired sprint performance in elite cyclists. The ATP-PC presents with a high effort to recovery ratio, with Bogdanis et al. (1995) observing a half life of 56.6 +/- 7.3 s for PC resynthesis. Hence recovery periods need to be considered is it it to be applied as part of a pacing strategy. Hazell et al. (2010) found in a study looking at the effect of 10 s sprint interval performance that a 2 min active recovery period allowed participant to maintain achieve a very similar percentage of peak power in subsequent sprints as a 4 min active recovery period, 95% and 96% of peak power respectively. Stevens and Dascomb (2015) found that in TT type tests that sprints within these do not affect the repeatability of a result, when looking at mean power for the effort indicating that these are tolerated. Currently FTP and CP are two common assessments of performance in the field. These tests all use TT type efforts to assess mean power values given time, from this calculate sustainable power or power at lactate threshold. Maximal TT like efforts are a reliable and ecologically valid method of evaluating performance in the field and are tolerant to sprint efforts during a TT effort (Stevens and Dascombe, 2015). For short maximal efforts of 4 min, such as those required by the CP formula for the quantification of anaerobic work capacity, Nimmerichter et al. (2009) found small TT effort of this duration to be reliable, over various courses with a small degree of undulation and the effect of familiarisation with the course and protocol. A TT as a method of assessing average power was found by Stephens and Dascombe (2015), to provide repeatable results, with a coefficient of variance of <1% where the test were conducted by relatively fit athletes, familiar with the environment and the test procedure. Peterman et al. (2015) while examining the drag area and performance found field testing with a power meter to more accurately determine performance than lab based tests, including VO2 peak, lactate threshold and economy and that power alone poorly predicted performance in TTs due to inter-individual differences in aerodynamic resistance. Other environmental factors that can affect the reliability of field testing include temperature (Peiffer and Abbiss, 2011), air pressure and humidity and the degree of acclimatisation (Racinais et al., 2015). Due to it’s ease of application and ecological validity, FTP is widely used by cyclists and coaches for defining training intensities. FTP requires a simple, single field test to evaluate. Either average power for 20 min (P20) or average power for 60 min (P60) is used to determine FTP, with P60 being equal to FTP and 95% of P20 average power being an approximation of FTP. FTP is said to be analogous with power at lactate threshold (Allen and Coggan, 2006). Due to the proprietary nature of the concepts, little is published in the academic literature testing and evaluating FTP, normalized power™ (NP) and training stress score™ (TSS). It is not clear from the available literature how LT was determined, however, it can be inferred. Coggan (2003) states “(LT is) defined as a 1 mmol/L increase in blood lactate over exercise baseline”. From this we can assume Coggan (2003) is referring to MLSS. MLSS is defined by Schuylenbergh et al. (2004) as “the highest constant workload during which lactate increased no more than 1 mmol x 1-1 from min 10 to 30” in a constant-load 30 min test”. FTP was found by Gavin et al. (2012) to be equivalent to power where lactate is measured at 4 mmol and not MLSS. This result is in itself is strange since the definition of lactate threshold being where blood lactate is measured at 4 mmol·L-1 does not take into account inter individual differences in blood lactate kinetics. Also, in Gavin et al. (2012) used a different protocol than the protocol based on either P20 or P60 typically used to identify FTP, using an 8 min TT. Miller et al. (2014) found CP to be a better predictor of mountain bike race performance. However Millar et al. (2014) did not define FTP from either P20 or P60 methods, but rather performed a normal lactate test and defined FTP as the power at 4 mmol·L-1 blood lactate. This does not match any definition of FTP, hence it is not actually test whether FTP can predict exercise performance. Miller et al. (2014) compared intermittent power (IP) and FTP for predicting performance outcome in a cross-country mountain biking (XCO). The rationale for comparing IP to FTP was that it might better at predicting performance in XCO, due to the intermittent and high intensity nature of the sport. The authors followed the normal procedure for calculating FTP taking 95% of P20, while the intermittent power test includes 20 intervals of 45 sec interspersed with 15 sec recovery. The IP protocol was based on observations of the ratio of work to recovery in actual XCO race. Both models used linear regression to predict performance in an actual XCO race and were able to do so with significant accuracy (p < 0.01), with the IP model produced a not significant smaller error. This study support the notion that contextual testing might be more accurate in predicting performance, while at the same time finding that FTP is useful in predicting performance in events with highly variable power outputs. CP is specifically defined as the power-asymptote of the power to time to exhaustion curve. This curve requires at least three points of power for a given duration to be plotted. In a simplified form, this curve can be reduced to a straight line between two points with CP being equal to the slope of the line. Originally Monod and Scherrer (1965) who conceived the concept stated that exhaustion will not occur at exercise intensities below critical power. This statement, while intuitively wrong, is also discredited by Vanhatalo et al. (2011), who state that cannot typically sustained for durations greater than 30 min. Anaerobic work capacity, or W’ is specifically the curvature constant of the CP curve and can be understood to equal the “anaerobic reserve” or the finite amount of work that can be done above CP (Vanhatalo et al. 2011). This concept was tested by Dekerle et al. (2015) who had participants deplete 70% of W’ over 3 min and 10 min, followed by a period exercising at CP + 10%, for which the hypothesized would equal 30% of W’ should W’ equal anaerobic reserve. While for the 10 min test work completed was close to that predicted by the critical power model, for the 3 min test there was a greater degree of variability, with an average 49% more work being done in the 3 min test than predicted by the CP model. Dekerle et al. (2015) also found that a positive pacing strategy to be beneficial for exercise intensities above CP. While Dekerle et al. (2015) list a number of mechanism affecting such a strategy, such as the accumulation of hydrogen ions, or inorganic phosphates, it seems the greater relative contribution of ATP-PC system to powering an effort within this time frame is relevant, but not considered. Jones et al. (2008) tested exercise capacity 10% above and below critical power for leg extension. Using P magnetic resonance spectroscopy to measure metabolites and hence changes in homeostasis, the researchers found that 3 min after the beginning exercise, levels of phosphocreatine (PC) and remained elevated, and no further changes in metabolites (phosphate) and pH occurred. By contrast exercise 10% above CP resulted in a shorter exercise duration, a drop in PC, pH and an increase in hydrogen ion concentration and inorganic phosphates from this the authors conclude that CP does mark the highest constant work rate for a muscle. While CP does provide a method for quantifying an anaerobic reserve it does not account for efforts shorter than 2 min. For short efforts (Dekerle et al. 2015), CP does not accurately model performance. Morton and Billat (2004) adapted the model to account for this limitation, however this variation is widely used and also has a number of inherent constraints. In real world situations rate of recovery of W’ needs to be considered. Comparing CP and FTP, Miller et al. (2014b) found CP to better predict mountain bike race times and with less error. Issues with the definition of FTP used are evident, as it was taken to be power where blood lactate equals 4 mmol·L-1 during an incremental lab test. Added to these methods of assessing performance, modern software and equipment allows the on going collection of mean power for maximal efforts given time, negating the need for specific testing in certain circumstances. Both FTP and CP provide good methods of assessing cycling performance and can be used to predict race outcomes and as such, pacing strategy, yet longitudinal analysis of performance data may also provide an alternative in situations that call on an athlete to produce maximal effort. Varying power output over long efforts tends to reduce performance where environmental variables are constant (Marwood et al., 2013), however on a course with variable profile this may not be the case (Swain, 1997). Limitations to FTP and CP performance models occur where recovery between intermittent efforts is a factor and when short, high intensity efforts (< 2 min) are involved. Neither FTP nor CP account for sprint efforts using ATP-PC energy systems directly. No quantification of capacity in this exercise domain occurs, aside from in the form the W’ in CP. No method of assessing performance mentioned herein addressed the rate of recovery of W’. No clear answer seems to exist on what constitutes an ideal pacing strategy is complex due to the breath of intrinsic and extrinsic constraints affecting an outdoor performance. It is hypothesised that the ATP-PC system is relevant to performance outcome in TTs and as such should be contemplated as part of testing and a pacing strategy that varies depending on environmental context and an athlete’s relative abilities. Abbiss, C. R., Quod, M. J., Martin, D. T., Netto, K. J., Nosaka, K., Lee, H., Suriano, R., Bishop, D. and Laursen, P. B. (2006) ‘Dynamic pacing strategies during the cycle phase of an Ironman triathlon’ Medicine and Science in Sports and Exercise, 38(4) pp 726-34. Abbiss, C. R. and Laursen, P. B. (2008) ‘Describing and understanding pacing strategies during athletic competition.’ Sports Medicine, 38(3) pp. 239–252. Atkinson, G., Peacock, O. and Law, M. (2007) ‘Acceptability of power variation during a simulated hilly time trial.’ International Journal of Sports Medicine, 2(28) pp. 157-163. Bogdanis, G. C., Nevill, M. E., Boobis, L. H., Lakomy, H. K. and Nevill, A. M. (1995) ‘Recovery of power output and muscle metabolites following 30 s of maximal sprint cycling in man’ The Journal of Physiology, 482(2) pp. 467–480. Dekerle, J., de Souza, K. M., de Lucas, R. D., Guglielmo, L. G. A., Greco, C. C. and Denadai, B. S. (2015) ‘Exercise tolerance can be enhanced through a change in work rate within the severe intensity domain: Work above critical power is not constant.’, Public Library of Science, 10(9) [no page number]. Gastin, P. B. (2001) ‘Energy system interaction and relative contribution during maximal exercise.’ Sports Medicine, 31(10) pp. 725-741. Halson, S. L. (2014) ‘Monitoring Training Load to Understand Fatigue in Athletes.’ Sports Medicine, 44(2) pp. 139-147. Hazell, T., Macpherson, R., Gravelle, B. and Lemon, P. (2010) ‘10 or 30-s sprint interval training bouts enhance both aerobic and anaerobic performance.’ European Journal of Applied Physiology, 110(1) pp. 153-160. Jobson, S. A., Passfield, L., Atkinson, G., Barton, G. and Scarf, P. (2009) ‘The Analysis and Utilization of Cycling Training Data.’ Sports Medicine, 39(10) pp. 833-844. Johnson, E. C., Pryor, Luke, J., Casa, D. J., Belval, L. N., Vance, J. S., DeMartini, J. K., Maresh, C. M., Armstrong, L. E. and Pryor, L. J. (2015) ‘Bike and run pacing on downhill segments predict Ironman triathlon relative success.’ Journal of Science and Medicine in Sport, 18(1) pp. 82-87. Jones, A. M., Poole, D. C., DiMenna, F., Wilkerson, D. P. and Fulford, J. (2008) ‘Muscle metabolic responses to exercise above and below the ‘critical power’, American Journal of Physiology, 284(2) [no page number]. Martin, J. C., Milliken, D. L., Cobb, J. E., McFadden, K. L. and Coggan, A. R. (2010) ‘Validation of a mathematical model for road cycling power’ Journal of Applied Biomechanics, 14(3) pp. 276-291. Marwood, S., Atkinson, G., Wells, M., Boswell, G. P., Bradley, P. S., al, et, Fawkner, S., Hart, N. H. and Schinke, R. J. (2013) ‘Effects of magnitude and frequency of variations in external power output on simulated cycling time-trial performance.’ Journal of Sports Sciences, 31(15) pp. 1639-1646. Menaspà, P., Quod, M., Martin, D., Peiffer, J. and Abbiss, C. (2015a) ‘Physical demands of sprinting in professional road cycling.’ International Journal of Sports Medicine, 13(36) pp. 1058-1062. Menaspà, P., Martin, D., Victor, J. and Abbiss, C. (2015b) ‘Maximal sprint power in road cyclists after variable and Nonvariable high-intensity exercise.’ Journal of Strength and Conditioning Research, 11(29) pp. 3156-3161. Miller, M., Stroudsburg, E., Follow, Witmer, C., Moir, G. and Davis, S. (2014a) ‘Predictive validity of critical power and functional threshold power for mountain bike race performance.’ International Journal of Exercise Science, 9(2) p. 55. Miller, M. C., Moir, G. L. and Stannard, S. R. (2014b) ‘Validity of using functional threshold power and intermittent power to predict cross-country mountain bike race outcome.’ Journal of Science and Cycling, 3(1) pp. 16-20. Monod, H. and Scherrer, J. (1965) ‘The work capacity of a synergic muscular group.’ Ergonomics, 8(3) pp. 329-338. Morton, R. H. and Billat, L. V. (2004) ‘The critical power model for intermittent exercise’ European Journal of Applied Physiology, 91(2) pp. 303-307. Nimmerichter, A., Williams, C., Bachl, N. and Eston, R. (2010) ‘Evaluation of a field test to assess performance in elite cyclists.’ International Journal of Sports Medicine, 3(31) pp. 160-166. Padilla, S., Mujika, I., Angulo, F. and Goiriena, J. (2000) ‘Scientific approach to the 1-h cycling world record: A case study.’ Journal of Applied Physiology, 89(4) pp. 1522-1527. Peiffer, J. and Abbiss, C. (2011) ‘Influence of environmental temperature on 40 km cycling time-trial performance.’ International Journal of Sports Physiology and Performance, 2(6) pp. 208-220. Peterman, J., Lim, A., Ignatz, R., Edwards, A. and Byrnes, W. (2015) ‘Field-measured drag area is a key correlate of level cycling time trial performance.’ PeerJ, 11(3) [no page number]. Racinais, S., Périard, J. D., Karlsen, A. and Nybo, L. (2015) ‘Effect of heat and heat Acclimatization on cycling time trial performance and pacing.’ Medicine and Science in Sports and Exercise, 47(3) pp. 601-606. Skiba, P. F. and Clarke, D. C. (2013) ‘Rationale and resources for teaching the mathematical modeling of athletic training and performance. A Personal View.’ Advances in Physiology Education, 37(2) pp. 134-152. Stevens, C. J. and Dascombe, B. J. (2015) ‘The reliability and validity of protocols for the assessment of endurance sports performance: An updated review.’ Measurement in Physical Education and Exercise Science, 19(4) pp. 177–185. Swain, D. P. (1997) ‘A model for optimizing cycling performance by varying power on hills and in wind.’ Medicine & Science in Sports & Exercise, 29(8) pp. 1104–1108. Thomas, K., Stone, M., Thompson, K., Clair, S. and Ansley, L. (2010) ‘The effect of self- even- and variable-pacing strategies on the physiological and perceptual response to cycling.’ European Journal of Applied Physiology, 8(112) pp. 153-160. Thomas, K., Stone, M. R., Thompson, K. G., St Clair Gibson, A. and Ansley, L. (2012) ‘Reproducibility of pacing strategy during simulated 20-km cycling time trials in well-trained cyclists.’ European Journal of Applied Physiology, 112(1) pp. 223–229. Thomas, K., Stone, M., St Clair Gibson, A., Thompson, K. and Ansley, L. (2013) ‘The effect of an even-pacing strategy on exercise tolerance in well-trained cyclists.’ European Journal of Applied Physiology, 113(12) pp. 3001–3010. Vanhatalo, A., Jones, A. M. and Burnley, M. (2011) ‘Application of critical power in sport.’ International Journal of Sports Physiology and Performance, 6(1) pp. 128–36. Wallace, L. K., Slattery, K. M. and Coutts, A. J. (2014) ‘A comparison of methods for quantifying training load: relationships between modelled and actual training responses.’ European Journal of Applied Physiology, 114(1) pp. 11-20. Surprised by Chris Froome’s downhill victory? There may be thought (science) behind it! Pacing strategy and performance modelling in cycling… MIGHT explain that tactic. I did my dissertation for my degree this winter on the topic of pacing strategy and performance modelling based on the Critical Power model. The subject was rather complex and as such I consider it a work in progress, since I barely scratched the surface of the subject. In fact, it’s been shelved for the time being and I wont get back to it as an academic, but possibly through some other realm (programming). I thought it interesting to see Chris Froome attacking on the descent and the tactic fit the logic underlying my hypothesis (in this case, ‘sprint’ to critical velocity, then get aero). Part of the story is in the literature review, second part in the actual write of the experiment I did. Please ignore any editorial errors, I was working and training while all this was being done and isolated 2000 km away from the university, not to mention problems with the .docx closed source format (sometimes okay is good enough and being a non-conformist has it’s price!). Although I got a reasonable grade, I was horrified to see formatting error with formulas and such months past the date. For any future research projects I will use a version control system like GIT and publish everything so that others may build on it if they wish. Development of a new model for individualized pacing strategy in non-drafting cycling events in hilly terrain. Sprint efforts in specific contexts, “contextual sprint efforts” (CsEs), were investigated as potential modification to pacing strategy in hilly cycling time trials (TT). It was hypothesised that CsEs would improve average velocity. A 9189 m course with 149 m of ascent was chosen to test the effect of CsEs on average velocity, average power, power variability, perceived exertion and average heart rate. 15 participants, mean critical power (CP) (240 ∓ 55 W) performed two tests involving two 30 s efforts with 2 min recovery, two 2 min efforts with 4 min recovery and one 9189 m TT. The first (InitialTT) being a maximal self-paced effort, the second (InstructedTT) involving a written cue suggesting CsEs to quickly reach contextual critical velocity (CCV) given a change in topography, but otherwise self-paced. Between tests no statistical difference was found for: average velocity (P = 0.2263), average power (P = 0.5214), rating of perceived exertion (RPE) (P = 0.08041) or average heart rate (P = 0.2192). CsE occurrence was significantly different (P =0.02139). External variables were controlled and not significantly different between conditions. These results indicate CsEs did not significantly affect finishing average velocity. A secondary objective tested certain factors against final average velocity for a linear relationship: recovery ratio between 30 s (30sRR) and 120 s (120sRR) efforts, mean 30 s power (30sW) and 120 s power (120sW) as well as critical power (CP). A strong association was found for CP (r = 0.7513) and 30sW (R2 = 0.7137) and a moderate association was found for 120sW (R2 = 0.6278). No linear association was found for the remaining factors. Multiple linear regression using mean 30 s power (30sW) and critical power (CP) had a strong association with outcome (adjusted R2 = 0.8994). This study indicates a test involving 30sW and CP together has a strong association with outcome in hilly TTs. Eventual race performance and relative success can be thought of as a product of physical capacities and the application of these capacities in the environmental context. These factors can be quantified through performance modelling and pacing strategy. In this study, pacing strategy, is defined as how an athlete distributes power (W) during a TT. An optimal pacing strategy is defined as the pacing strategy that results in the highest average velocity for a cyclist on a given course. Abbiss and Laursen (2008) reviewed the literature on pacing strategies in sport and note six different strategies: negative, all-out, positive, even, parabolic-shaped and variable pacing. Most of the strategies that have been examined in the literature do so in the context of stable or high controlled external variables, including topography. Atkinson et al. (2007) use simulated changes in topography in a laboratory, however it is not known whether these simulation reflect changes in resistance to motion given gradient or air resistance. Neither research observing variable pacing in race performances (Johnson et al., 2013) and laboratory based studies (Atkinson et al., 2007) consider aspects relating to contextual sprints to get up to speed and the contribution of the ATP-PCr metabolic pathway to effort, but rather focus on sustained efforts either side of steady state pace. Atkinson et al. (2007) varied effort by 5% W either side of the mean value established in a 50-60 min TT. This variation in intensity alone led to an improvement in time to completion of a set amount of work (800 kJ) in 5 of their 7 participants. The researchers did report to which point in the effort the protocol was fully tolerated by the remaining 2 participants and over all results were not better for the group as a whole. Abiss et al. (2006) looked at pacing strategy in well-trained triathletes taking part in an Ironman event. The triathletes adopted a dynamic pacing strategy given context, which in this case was dominated by wind with athletes increasing effort into the wind, hence to some degree experienced athletes may vary effort in certain context to greater effect, suggesting a variable and dynamic approach may be prefered by cyclists naturally. An even distribution of effort is commonly thought to be optimal (Thomas et al., 2012), however in road cycling, rarely are conditions found that remain constant and as such an even pacing strategy would be difficult to apply. Thomas et al. (2012) report increases physiological perturbation and perception of effort given a variable effort with work rates set at 72% and 142% of the average power of a self paced trial in a 1:1.5 ratio. For this study it was hypothesised that physiological and psychological perturbations could be minimised by only suggesting brief sprints at key points on a course with the rest of the effort being self-paced. It was hypothesised that sprint and short anaerobic glycolytic efforts held greater weight of importance than typically afforded by current performance models and pacing strategies contemplate where short sprints are not accounted and efforts above CP tend to be sustained high intensity efforts over relatively long periods of time, in the case of Thomas et al. (2012) ~60 s and longer in other studies utilizing less variation (Atkinson et al., 2007) which had cyclist perform 5% above self-paced average power till producing 100 kJ, or ~5-10 min depending the efficiency and sustainable power of the participant. Key to cycling performance is power development given topographical context and that high intensity efforts may be of a relevance not previously regarded. To maximise performance, CCV or sustainable velocity for a given context, must be regarded for each context and sprint effort may be useful in reaching CCV more quickly and for less physiological perturbation. Brickley et al. (2007) state that between variable efforts and steady effort if net energy cost remains similar, physiological perturbation remains similar supporting the noting rapid accelerations and changes to output given a change in context are achievable. Both mathematical models (Swain, 1997) and laboratory based research (Atkinson et al., 2007) demonstrate an improvement for adopting variable pacing for specific individuals. However other studies, both mathematical (Padilla et al., 2000) and experimental (Thomas et al., 2012) do show a benefit for even pacing, in static or highly controlled environments such as on laboratory ergometers or in velodromes. Hence may not apply to exterior TTs. The variable power output strategy postulated by Swain (1997) theoretically resulted in a quicker time to completion of a TT. Similar results were obtained independently using the equations presented by the model of road cycling power by Martin et al. (1998) using the concept of CsE. For the power variation suggested by Swain (1997), however it seems unlikely many cyclists could sustain the suggested variation of 10% above sustainable VO2 given later findings by Atkinson et al (2007) where certain participants among their sample were not able to sustain a variation of 5% yet alone the 10% variability suggested by Swain (1997). In terms of variation of effort this study investigates only a suggested increase in CsEs, which appear tolerable even under extreme stress given the finding by Marcora and Staiano (2010) and observations by Menaspà et al. (2015) where participants were able to develop high intensity efforts even after prolonged high intensity exercise. To know to what degree a cyclist can sustain a variable pacing strategy, quantification of sustainable power and anaerobic power is necessary. Laboratory measures such as lactate threshold testing, VO2max or CP can detect events analogous with sustainable power and measure anaerobic work capacity (AWC). The CP concept, originally conceived by Monod and Scherrer (1965), tested in the field can produce reliable and valid results (Karsten et al., 2014) in one day. One of the typical limitations of CP is that it is usually tested over several days. Karsten et al. (2014) however use an extensive recovery period between bouts of exercise (30 min) which may not be practical in terms of both time and managing the participant. Other research claims the reliability and validity of a single 3 min bout to test CP (Vanhatalo et al., 2007), with the final 45 s equivalent to CP implying AWC is exhausted in ~02:15 min. However these measures of AWC and yet alone a single maximal 3 min bout of exercise still do not distinguish sprint efforts relying on the ATP-PCr system from effort relying on anaerobic glycolysis. Other commonly used performance measures such as Functional Threshold Power (FTP) (Allen and Coggan, 2006) do not consider AWC at all aside a 5% correction on maximum average 20 min W. Miller et al. (2014) showed FTP was able to predict race performance in cross-country mountain biking (R2 = 0.736), while not exactly the same a hilly TT among, this was the only example of the predictive capacity of FTP in a variable cycling event. Likewise CP predicted performance with greater validity (R2 = 0.943) in cross-country mountain biking (Miller and MacDermid, 2015) e another study. This experiment set out to examine whether 30 s effort and 2 min, corresponding to effort which are 73% and 37% anaerobic (∓10%) (Gastin, 2001) could further build on CP to predict performance in variable TTs and whether CsEs in pacing on variable courses were of any significant relevance to outcome. All descriptive results are presented as mean (∓SD). 15 participants (female n = 2, male n = 13) took part in the experiment. Participants had an age of 33.1 (∓ 4.8) years and a mean weight of 67.53 (∓ 6.43) kg. Participants were recruited from triathlon and cycling clubs. This number of participants was chosen based on observation of sample populations used in similarly designed experiments reviewed previously and subsequent to a power analysis for the paired t-test (power = 80%, n = 9.9). All participants were between the ages of 26 and 40, amateur and federated in national federations for either cycling or triathlon. Participants were informed in their native language about what the study would entail, what information was collected and how it would be used. All participants had been subject to a sports medical exam in the past year and all participants provided signed informed consent. The study was approved by the Ethics Committee of Manchester Metropolitan University on 16th October 2015. One 9189 m TT on a hilly course. Both 30 s and 2 min efforts took place on a slightly rising (1.3%) road with an even gradient. Recovery involved cycling slowly back to the start. The large lap involved a hilly circuit with and 149 m of ascent and 146 m of descent with start and finish occurring at slightly different places the course was measured at 9189 m. The course consisted of 3.6 km of climbing, 2.3 km flat and 3.3 km downhill, the course had a minimum altitude of 85 m and a maximum of 149 m.
Throughout both tests the following variables were recorded: heart rate (b.p.m.) and GPS location (1 hz sampling, error ∓ 8.7 m) were recorded using a Garmin 910XT (Garmin International Inc., Olathe, Kansas, USA). Velocity (m.s-1) and altitude was inferred by the Garmin 910XT from position and time data. GPS derived altitude data presents with an error 5-10% (Menaspà et al., 2014) hence was corrected using altitude correction application Strava (Strava Inc, San Francisco, CA, USA) which uses a resolution of 30 m against a database of survey values providing consistent measurements of altitude. W was directly recorded using a PowerTap (Saris Cycling Group, Inc., Fitchburg, Wisconsin, USA). The PowerTap was found by Bertucci et al. (2005) to offer a degree of validity and reliability to render it suitable for submaximal laboratory tests presenting to a coefficient of variation of 0.9 to 2.9 %. For sprint efforts PowerTap could report as much as 8% less power if a low cadence was used (Bertucci et al., 2005). Gardner et al. 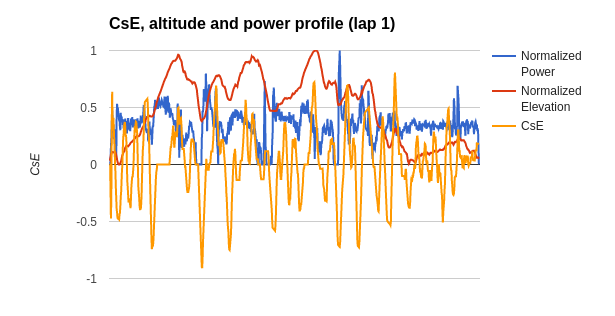 (2004) also found the PowerTap to be valid and reliable with a mean error of -2.7 ∓0.1% over an 11 month period. Gardner et al. (2004) also mention the PowerTap can be significantly affected by large temperature differences (8-21 ºC). The PowerTap was calibrated prior to each test lap. Cadence (r.p.m.) 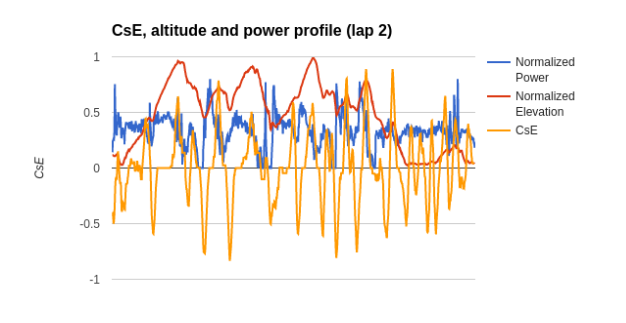 was indirectly inferred in real time by the PowerTap from variations in power delivery. Participants used their own bicycles for the test with the PowerTap fitted. After each test participants rated their effort on the 6-20 Borg scale (Borg, 1998), between 1 and 2 min after completing the TT. Before each test, participants were asked to abstain from heavy exercise in the three days prior and replicate their diet and training from the first test, for the second test. Tests took place within the same hour for each test and the InstructedTT took place between 3 and 7 days after the InitialTT. Before each test participants were asked to keep a diet and exercise log for the three days before and replicate these behaviour in the second test. Weather data (temperature, wind, wind direction, air pressure, humidity, precipitation) was obtained online from a meteorological station at the site (Autódromo Internacional do Algarve) and recorded. Body weight (including clothing, excluding shoes and helmet) was recorded with a BC-1500 Ironman® scale (Tanita Corporation of America, Inc., Clearbrook, Illinois, USA) Equipment weight (bicycle, shoes, bottles and helmet) was measured by standing on the scales with the full equipment and subtracting this from body weight measured previously. While this experiment does not look at specifically psychological aspects of pacing, mood state was controlled using a Portuguese adaptation of the POMS (Viana et al., 2001). Given findings by Marcora et al. (2009) which detail changes in performance for mentally tired participants it was considered necessary to control psychological aspects. After each test, participants were also asked to report Borg RPE (6-20). After each test participants were asked to inform of any mechanical or traffic incidents. Raw data was converted to comma separated values for analysis. Mean (∓ SD) values for W, HR, speed, RPE were calculated and presented for both TTs. From the W data collected, recovery ratios, variability using weighted power (WP), CsEs and CP were calculated and presented as mean (∓ SD) for both conditions. For paired samples, once all other assumptions of normality were met, normality was tested using the Shapiro-Wilks test and visual inspection using the boxplot method. Subsequent to the data being assumed normal, paired t-tests were conducted on each of the aforementioned variables between conditions, where data was assumed not normal the Wilcoxon signed rank test was used. Statistical significance was set at P < 0.05. Correlations between performance (average speed) and potential predictors of performance (energy expenditure, efficiency, 30sW, 120sW, 30sRR, 120sRR and CP) were tested using linear regression and multiple linear regression. Multiple linear regression was used on 30sW and CP and the data was not further fitted using polynomial functions. Controlled variables were analysed using paired t-tests followed by a Bonferroni correction. Due to the fact that variability as defined above does not discern context, further analysis was conducted to detect CsEs. Two factors, assumed to be of key importance were analyzed: effort intensity and context. Effort intensity simply refers to power over time and context refers to the topographical situation that effort was produced in. Data was normalized using Z-scores for both W and percent gradient data for the entire lap duration for each participant. Z-scores were chosen to normalized the data used in the CsE analysis as this method was more tolerant of errors in the data, such as outlying data points. Z-scores effectively polarized the data, for power data this had the effect of granting a score of 1 to values about 10% higher than an individual’s critical power, thus distinguishing efforts with a significant anaerobic contribution for those less significant. For gradient data, this effectively returned zero for descents and 1 for uphill sections. The effect of this was to attribute a score of < 0.5 where power was not significant and >0.5 where an effort was significant in amplitude and context. This checked the average CsE 10 s before a and ahead of particular point for a significant effort (near 1) and checking ahead for the change in effort and context (near 0). If it detects an effort, this value will be greater than 0, with high values (>0.5) being deliberate sprints in context. A 10 s window either side was chosen because it relates to the duration of a short sprint. CsE cannot distinguish efforts longer than 10 s where there is a significant grade and significant power produced, from an effort of not significant power on a not significant grade as under both circumstances zero is returned. Figure 1.) Average velocity 10.31 m.s-1, power 337 W, CsE score 24.22. Figure 2.) Average velocity 10.31 m.s-1, power 323 W, CsE score 34.41. From the two figures it can be seen peaks in power coinciding with peaks on the course occur with greater magnitude in the InstructedTT and these efforts are flagged by CsE (orange line). Of 15 participants, 10 yielded full datasets, 5 more yielded partial data. Of the 15 sets of data, two participants performed under outlying differences in wind speed and their data was removed from calculations of CsE. Four participants failed to complete the 9189 m lap, hence only 7210 km of the lap could be used for analysis. Lap average velocity was used in place of lap time due to correction made to lap length for participants who failed to complete the full lap, these data was used used for within participant analysis only. The shortened lap was still sufficiently long for all participant for other purposes such as testing CP (Vanhatalo et al., 2011). Five participants had heart rate (HR) data proved invalid containing either null values, or values lying well beyond those those considered normal (>220 b.p.m.). For none of the measured performance variables was a statistically significant difference found. A smaller sample (n = 9) was used to compare HR data due to data corruption for several participant files. Except for heart rate, sample size was 13. Data from the last 2 participants to be tested was removed due to excessive differences in wind. RPE did not meet all the assumptions of normality when tested with the Shapiro-Wilk test (W = 0.7903, p-value = 0.002765) and as such was tested with the Wilcoxon signed rank test (V = 37, p-value = 0.08041) indicating the perceived effort was not significantly different. All other tests on the dependent variables listed below were performed with paired t-tests. Dependant variable IntialTT InstructedTT t( degrees of freedom), p.
Table 1.) Mean (∓SD) for dependant variables for both tests. *RPE was tested with the Wilcoxon signed rank test. Inferred variable IntialTT InstructedTT t( degrees of freedom), p.
Table 2.) Mean (∓SD) for inferred variables for both tests. Of the inferred variables calculated, only CsE detected a significant difference between conditions signifying participants responded to the treatment. In terms of 4 participants presented with a drop in variability. Among the 4 participants that presented with a drop in variability are the participants that presented with the greatest magnitude change in average lap speed (4.55% and -5.91% respectively). For both conditions combined mean CsE score was 34.30 (∓ 8.78). CsE was further analysed using boxplots to understand the true extent of change in this variable. Figure 3.) Change in CsE score between conditions. Mean energy expenditure (kJ) was calculated for both conditions and corrected to a value of kJ per km (efficiency). For InitialTT efficiency was 28.01 (∓ 3.84) while for the InstructedTT it was 27.59 (∓ 4.16) this difference was not statistically significant (P = 0.154) and essentially reflects a reduction in time and power for the InstructedTT. For all but three subjects economy of effort was lower in the InstructedTT. Linear associations were tested using 26 data pairs. A weak association was found between efficiency and average velocity F(1,24 = 29.78, p = 0.00001278 (R2 = 0.4417) and between global energy expenditure for the full 9189 m lap and average velocity a moderate association was found F(1,16) = 27.97, p= 0.000007343, R2 = 0.6134. Linear regression was further used to examine the association between 30sW and outcome F(1, 18) = 44.87, p = 0.0000002785, R2 = 0.7137. For the relationship between average 120sW effort and outcome F(1,18) = 30.36, p = 0.000003114, R2 = 0.6279. CP was tested against average velocity yielding F(1,18) = 70.02, p= 0.0000000027, R2 = 0.75 presenting the best association without come of any of the inferred or measured performance variables. Due to missing data 30sW and 120sW data, only 20 tests could be used for comparing 30sW, 120sW and CP data with outcome. 30sRR (0.99 ∓ 0.1337469209) and 120sRR (0.98 ∓ 0.06552246817) were both separately plotted against average velocity and no linear relationship was evident, further further analysis using linear regression confirmed this (R2 = 0.191) for 30sRR and (R2 = 0.014) for 120sRR. No linear relationship was evident in plots of speed and CsEs. CsE was tested against outcome for all data in both conditions using linear regression (R2 = 0.177) no relationship was found. Two tailed paired samples t-tests were conducted on the following controlled variables between both conditions: wind speed, air pressure, air temperature, mood state and humidity. Controlled variable IntialTT InstructedTT t( degrees of freedom), p.
Table 3.) Mean (∓SD) for controlled variables for both tests. To further investigate if difference in air pressure was actually significant, alveolar partial pressure was calculated for mean pressure under both condition: pO2 109 and 110 which was considered insignificant. Resistance to motion was tested using the equations of Martin et al. (1998) using mean values for all the relevant variables and a frontal area of 0.5 m, rolling resistance of 0.4 and no rise, yielded 11.29 m.s-1 and 11.31 m.s-1 for both average pressures, or a difference of about 1.4 s over 9.189 km. Air pressure was not deemed a significant factor. Two outliers were identified for POMS in the InstructedTT with scores of 47 and 60. The data from controlled variables were subject to a Bonferroni correction yielding the following p-values: wind, 1.00000; air pressure, 0.07865; air temperature, 1.00000; humidity, 0.40455; mood state, 1.00000. Supporting the previous assumption that air pressure differences were not significant. The experiment was designed to test the effect of dynamic pacing -specifically sprinting in certain contexts on outcome measured as average velocity and to test for potential predictors of performance: CP, 30sRR, 120sRR, 30sW and 120sW. Controlled variables remained stable enough not to severally challenge the reliability of the experiment. For testing CP, Vanhatalo et al. (2011) recommend efforts of between 2 and 15 min that have a difference of at least 5 min in magnitude between efforts, the test used in this study was designed considering these limits. While CP has been shown to be testable with a single maximal 3 min bout of exercise (Vanhatalo et al., 2007), it was chosen to test CP with several bouts of exercise: Two repeated efforts of the same duration were used for 30sW and 120sW, rather than efforts of different durations to provide a value for recovery ratio. No association was found between recovery ratio and outcome. While each component of a normal CP test is done on separate days, it was chosen for the test to follow this format in order to see actual difference between bouts for the given recovery recovery period. The 30 s intervals were considered less problematic than the 2 min intervals: Hazell et al. (2010) found no significant difference between 2 and 4 min rest intervals for 30 s maximal sprints. Bogdanis et al. (1995) place the half life of phosphocreatine resynthesis at 56.6 s (∓ 7.3) suggesting participants would be mostly recovered after 2 min. Shorter sprint efforts may be more useful in testing the capacity of the ATP-PCr system since in 30 s this system only relate to ~28% of power produced (Smith and Hill, 1991). Any future protocol based on this study should consider using 10 s sprints in place of the 30 s sprints. No research was found relating specifically the rate of regeneration of AWC from a 2 min all out effort, however in the experiment itself recovery ratio was 0.98 suggesting that the 4 min active recovery suggested in the protocol was sufficient. Recovery ratio in the 30 s interval 0.99 was greater than those observed by Hazell et al. (2010) which saw a recovery ratio of 0.89 who used twice the recovery period (4 min). While the 2 min maximal efforts used in this test protocol may not be enough to completely exhaust AWC (Chidnok et al., 2013) while findings by Vanhatalo et al. (2007) would indicate a 2:15 period for the exhaustion of AWC. Dekerle et al. (2015) found that rates of AWC are not constant and as such the use of 3 min max effort may better ensure exhaustion of AWC across a broader range of individuals. Future protocols may consider using 3 min max effort, sufficient to completely exhaust AWC (Chidnok et al., 2013) as well as providing a more accurate measure of the rate of replenishment of AWC once this has been completely exhausted. AWC is most often treated as a finite reserve and not a capacity with regenerative ability, yet it seems probable that some degree of regeneration occurs every time power drops below critical power. Both 30sRR and 120sRR were examined to see whether they had a relationship with performance, suggesting that for this study regeneration of AWC was not a factor, either due to participants maintaining some reserve, or this reserve adequately regenerated between extreme efforts. 3 min efforts may provide the best compromise for testing CP and AWC, however if any future tests are run concurrently such as this one, a different recovery period may be required. CP and 30sW did present with strong an association with outcome while 120sW a less strong outcome. These findings were counterintuitive as the metabolic regime employed in 30sW was distinctly different to that in the TT. From this analysis It is not possible to know whether a higher 30sW signifies more frequent or efficacious use of sprint efforts or whether some other related mechanism allows for better performance in the TT. It’s not know whether the CP and 30sW combination would predict performance in conditions that are not variable. It is assumed that since CP approximates the average power over maximal efforts up to about 30 min and has been shown to predict 16.1 km TT performance (Black et al., 2015), that it alone would provide the most accurate predictor of performance over the combination of CP and 30sW found in this study, in situations with less topographic variation such as long climbs and flat time trials. Future investigation could analyse to what degree a course/athlete combination would benefit from either a variable or steady pacing strategy. No association was detected between CsE and outcome, perhaps because CsE does not describe the magnitude or length of an effort. Future models need to look at a broader range of contexts the magnitude and duration of effort developed in these contexts and give them a weighting according to relevance of context. To examine CsE scores better above 32 was chosen to define a deliberate use of CsE sprints as part of pacing strategy. Of 13 valid samples, 8 participants had a CsE score of above 32 in InitialTT (mean 39.12 ∓ 4.5). In the InstructedTT this number increase 10 (mean 41.37 ∓ 4.6). Three participants showed no deliberate adoption of the strategy as per the experimental treatment in the InstructedTT. Participants that naturally adopted CsE sprints (n=8) saw a small increase in CsE score (mean 3.31) between the two TTs. Of those that did not naturally adopt CsE sprints (n=5), 1 negatively adopted the strategy (-6.4), 2 presented with little difference between the conditions (-0.4), 2 saw a large increase in CsE (mean = 11.75). Figure 4.) 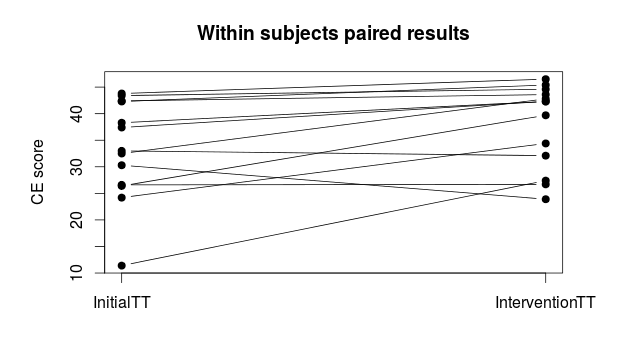 Paired results for the application of CsEs. Neither CsEs, variability, CP or were able to account for improvements in performance and drops in average power for 2 participants, hence further analysis was done on the distribution of effort. This was done by counting 1 s interval at CP as measured in the InitialTT and subsequently, CP + 40%, CP + 60%, CP + 80% and CP + 100%. Certain participants (N= 2) improved performance while reducing average power and with little apparent change in CsEs, they still presented with a greater number of efforts in the extreme domain, the sum of efforts above CP 40% in both conditions was 38 and 91 for one participant, 295 and 360 for the other suggesting a deliberate increase in extreme efforts, although in a different context to that detectable by the CsE method in its current form. CsE only partly accomplished the task it was designed for. Partially asserting the idea that AWC is not a single quantity is the concept of functional reserve capacity (FRC). Marcora and Staiano (2010) found among a group of 10 rugby players who cycled to exhaustion that a residual capacity roughly three times as high as the intensity level required to induce this exhaustion existed. FRC would indicate capacity to sprint contextually in situations such as sprinting into a descent at the end of an “all out” effort on a climb. This conclusion is also supported by Menaspà et al. (2015) who found that constant high intensity effort for 10 min did not affect subsequent sprint performance in elite cyclists. Hence it was assumed that a sprint at the end of an all out climb was viable for athletes and may provide an effective pacing strategy while reducing homeostatic disturbance. In this experiment however no benefits were gained sprinting. The benefits that may exist are probably later negated by reductions in effort in other areas of the course. Vanhatalo et al. (2011) refers to individuals that have high CP having relatively small AWC supporting the observations by Atkinson et al. (2007) that cyclists with a ventilatory threshold closer to their VO2max were less tolerant to the imposed variations in intensity. 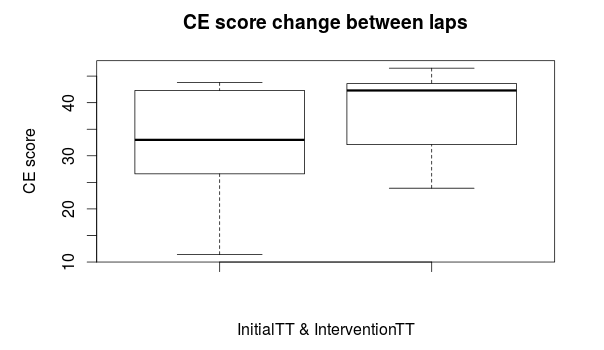 In the InitialTT, 8 participants naturally adopted the CsE strategy electively without instruction, so of which despite having a relatively small AWC (less than double CP in the 2 min test), it is though that CsEs generally are too short to elicit a large degree of physiological perturbation, and as such better tolerated and are employed even by cyclists with a small AWC. None of the athletes tested were specifically trained in sprinting and three had relatively little experience of the sport. None of the participants adopted other techniques aimed at increasing CCV or reducing effort, such as using an aerodynamic tuck on descents. CsE score worked in this specific scenario to detect specific efforts that related to the application of the particular pacing strategy being applied. CsE did not explain power distribution efficacy completely, with some participants producing better performances for similar CsE values. Further analysis did reveal an increase in time and magnitude of efforts for those participants that did not show an improvement, suggesting there are other contexts in which extreme efforts can produce a benefit. In terms of predictors of performance, 30sW, counter intuitively had a stronger linear relationship with outcome than any of the other variables analyzed except CP. These factors when combined were seemingly the strongest predictor of performance and merit further research using independant tests. Wind direction was accounted for, but no analysis was conducted on it on the assumption that as the course was on a roughly circular circuit the effect of wind direction would negate itself. Precipitation data was not analyzed since 14 participants performed each test in the same conditions (dry) and 1 participant performed both tests with wet road conditions. It was assumed that participants once provided with a meal diary for the 24 h before the experiment would repeat their stated food intake and that participants would arrive at the test in a similar state of fatigue following the same training logged in the InitialTT. Despite participants being familiarised with the course before hand and 3-7 days separating both tests, a learning effect exist. Although large efforts were made to make this ecologically valid test reliable, effect size would need to be large to be significant given the potentially compounding effect of so many controlled variables and even the reliability of the test apparatus. In terms of the validity of using a hilly TT to test CP, this is a potential flaw despite Stevens and Dascomb (2015) finding TTs are valid to test performance, including somewhat variable course, the variability of the courses analysed is unlikely to be as high as in this experiment. Pacing strategies reviewed in Abbiss and Laursen (2008) may too be simplistic in attempting to describe cycling pacing on variable terrain. This study found intra-individual difference in power distribution can vary significantly, for similar results in average velocity, perceived exertion and average heart rate. Atkinson (2007) and Thomas et al. (2013) have demonstrated a benefit in terms of work done of using a variable pacing strategy in a lab test, but not utilising deliberate sprint efforts. This study addressed this sprint in an ecologically valid setting, it did not find significant benefit in terms of time saved on a course, nor significant differences in other variables except in the amount of time performing CsEs. CP was able to a large degree explain performances, when CP and 30sW were taken together a stronger relationship was observed suggestion that a protocol such as the one detailed may be useful in determining performance. This would require further validation. Future research should involve a test and TT one in a controlled environment (lab) and one in the field so that any predictions made in the test are completely independant of the TT result. Abbiss, C. R., Quod, M., Martin, D., Netto, K., Nosaka, K., Lee, H., Surriano, R., Bishop, D. and Laursen, P. (2006) ‘Dynamic pacing strategies during the cycle phase of an Ironman triathlon.’ Medicine and Science in Sports and Exercise, 4(38) pp.726-734. Allen, H. and Coggan, A. (2006) Training and racing with a power meter, 2nd edition, Boulder, CO., VeloPress. Atkinson, G., Peacock, O. and Law, M. (2006) ‘Acceptability of power variation during a simulated hilly time trial.’ International Journal of Sports Medicine, 2(28) pp. 157-163. Bertucci, W., Duc, S., Villerius, V., Pernin, J. and Grappe, F. (2005) ‘Validity and reliability of the PowerTap mobile cycling powermeter when compared with the SRM device.’ International Journal of Sports Medicine, 26(10) pp. 868–873. Brickley, G., Green, S., Jenkins, D., McEinery, M., Wishart, C., Doust, J. and Williams, C. (2006) ‘Muscle metabolism during constant- and alternating-intensity exercise around critical power.’ International Journal of Sports Medicine, 28(4) pp. 300-305. Black, M., Bailey, S., Jones, A., Morgan, P. and Vanhatalo, A. (2015) ‘Conventional critical power test predicts 16.1 km road time trial performance.’ In The Physiological Society, Proceedings of The Physiological Society. Cardiff, UK (2015) [no page number]. Borg, G. (1998) Borg’s Perceived Exertion and Pain Scales, Champaign, Il., Human Kinetics. Bogdanis, G. C., Nevill, M. E., Boobis, L. H., Lakomy, H. K. and Nevill, A. M. (1995) ‘Recovery of power output and muscle metabolites following 30 s of maximal sprint cycling in man,’ The Journal of Physiology, 482(2) pp. 467-480. Chidnok, W., Dimenna, F., Bailey, S., Wilkerson, D., Vanhatalo, A. and Jones, A. (2013) ‘Effects of pacing strategy on work done above critical power during high-intensity exercise.’ Medicine and Science in Sports and Exercise, 45(7) pp. 1377–85. Dekerle, J., de Souza, K. M., de Lucas, R. D., Guglielmo, L. G. A., Greco, C. C. and Denadai, B. S. (2015) ‘Exercise tolerance can be enhanced through a change in work rate within the severe intensity domain: Work above critical power is not constant.’ Public Library of Science (PLoS), 10(9) e.0138428. Gardner, A. S., Stephens, S., Martin, D. T., Lawton, E., Lee, H. and Jenkins, D. (2004) ‘Accuracy of SRM and power tap power monitoring systems for bicycling’ Medicine and Science in Sports & Exercise, 36(7) pp. 1252-1258. Gastin, P. B. (2001) ‘Energy System Interaction and Relative Contribution During Maximal Exercise’, Sports Medicine, 31(10) pp. 725-741. Johnson, E. C., Pryor, J. L., Casa, J. D., Belval, L. N., Vance, J. S., DeMartini, J. K., Maresh, C. M. and Armstrong, L. E. (2013) ‘Bike and run pacing on downhill segments predict Ironman triathlon relative success’ Journal of Science and Medicine in Sport, 18(1) pp. 82-87. Karsten, B., Beedie, C., Jobson, S. A., Hopker, J. G. and Stevens, L. (2014) ‘Validity and reliability of critical power field testing.’ European Journal of Applied Physiology, 115(1) pp. 197-204. Marcora, S. M., Staiano, W. and Manning, V. (2009) ‘Mental fatigue impairs physical performance in humans’ Journal of Applied Physiology, 106(3) pp. 857-864. Marcora, S. M. and Staiano, W. (2010) ‘The limit to exercise tolerance in humans: mind over muscle?’ European Journal of Applied Physiology, 109(4) pp. 763-770. Martin, J. C., Milliken, D. L., Cobb, J. E., McFadden, K. L. and Coggan A. R. (1998) ‘Validation of a Mathematical Model for Road Cycling Power’ Journal of Applied Biomechanics, 14(3) pp. 276-291. Menaspà, P., Impellizzeri, F., Haakonssen, E., Martin, D. and Abbiss, C. (2014) ‘Consistency of commercial devices for measuring elevation gain.’ International Journal of Sports Physiology and Performance, 9(5) pp. 884–6. Menaspà, P., Martin, D., Victor, J. and Abbiss, C. (2015) ‘Maximal sprint power in road cyclists after variable and Nonvariable high-intensity exercise.’ Journal of Strength and Conditioning, 29(11) pp. 3156-61. Miller, M. C., Moir, G. L. and Stannard, S. R. (2014) ‘Validity of using functional threshold power and intermittent power to predict cross-country mountain bike race outcome.’ Journal of Science and Cycling, 3(1) pp. 16-20. Miller, M. C. and Macdermid, P. W. (2015) ‘Predictive validity of critical power, the onset of blood lactate and anaerobic capacity for cross-country mountain bike race performance,’ Sports and Exercise Medicine Open Journal, 4(1) pp. 105–110. Monod, H. and Scherrer, J. (1965) ‘The work capacity of a synergic muscular group.’ Ergonomics, 8(3) pp. 329–338. Smith, J. C. and Hill, D. W. (1991) ‘Contribution of energy systems during a Wingate power test.’ British Journal of Sports Medicine, 25(4) pp. 196–199. Thomas, K., Stone, M. R., Thompson, K. G., St. Clair Gibson, A. and Ansley, L. (2012) ‘The effect of self- even- and variable-pacing strategies on the physiological and perceptual response to cycling.’ European Journal of Applied Physiology, 8(112) pp. 3069-3078. Vanhatalo, A., Doust, J. and Burnley, M. (2007) ‘Determination of critical power using a 3-min all-out cycling test.’ Medicine and Science in Sports and Exercise, 39(3) pp. 548–55. Vanhatalo, A., Jones, A. M. and Burnley, M. (2011) ‘Application of Critical Power in Sport’ International Journal of Sports Physiology and Performance, 6(1), pp. 128-136. Viana, M. F., de Almeida P. L. and Santos, R. C. (2001) ‘Adaptação portuguesa da versão reduzida do Perfil de Estados de Humor – POMS’ Análise Psicológica, 1(19) pp. 77-92. I’ve followed a thread on the Facebook and there some views aired on ‘which burns more fat’ and ‘which is harder’. Running is a high impact active, it involves repeatedly striking the ground with impact force of roughly 2 -3 times body weight. That means that as a 70 kg human being, your leg muscles, bones and ligaments are subject ~210 N of force every single step of the way. Now cycling, on the other hand has negligible impact. The bike is supporting your body weight and eccentric forces acting on the musculature and bones are negligible. It’s worth noting this is true of road cycling, but not mountain biking. Muscle contraction type also differs. In cycling muscle contractions are concentric, that is the muscle is lengthening. This is also the type of contraction that produces the least force. In running there’s the whole array of muscle contraction type: concentric (in propulsive phases) and eccentric on the breaking phases. The degree of muscle activation in the running movement actually occurs just before ground contact in running as the body ‘pre-empts’ the impact. So which is harder on the muscles? Running by far. This is the reason we see bike races lasting weeks, while just one marathon takes weeks to recover from. You can do a massive amount of cycling before needing to stop. Why is it ‘easier’ to run hard than cycle hard? In cycling the volume of muscle used by the activity and requesting oxygen from the respiratory system is less (60% versus 80% in running). In both sports, trained athletes are able to attain ‘VO2max’ -that is maximal aerobic capacity, or the maximum amount of oxygen that your body can absorb. The body, like a combustion engine needs oxygen to produce energy: fuel + oxygen ≅ energy; heat + work. VO2max represents a ceiling of how much energy can be ‘burned’ aerobically. Where VO2max can’t be attained it’s unlikely that that exercise will be as effective at burning fat as these ‘big muscle group’ exercises. Other factors leading to performance in sport are efficiency and energy derived through other (anaerobic) mechanisms, also at which point one reaches Lactate threshold (LT), which varies from sport to sport and basically defines rates of sustainable exercise. For sub-maximal exercise, a roughly linear relationship exists between heart rate and energy expenditure -regardless of exercise modality; the unit cost of oxygen per amount of energy remains very similar regardless of ‘metabolic substrate’ (that’s fuel; Carbs, Fat, Protein). So what we’re seeing is if you cycle at the same intensity you run, you’ll burn round about the same amount of energy! Excess post-exercise oxygen consumption (EPOC) is also about the same when comparing cycling and running, so post exercise fat burning remains about the same for both. So which is harder on ventilatory/cardiovascular system? They’re the same more or less, it depends how hard you exercise and not how you exercise. N.b. one important aside: LT will likely come a different stages in the same person doing the two sports. Generally LT is higher while running than cycling, except trained cyclists: If you’re a runner, runner is ‘easier’. If you’re a cyclist, cycling is easier. If your neither, then running is easer. Non-cyclists find it hard to reach VO2max on a bicycle. The much ignored nervous system: the one that actually gets you up, out and exercising is obviously also an important factor. Both sports provoke a large amount of cognitive load to people new to them: There are literally billions of ‘factors’, degrees of freedom open that the mind has to deal with. Think about what’s going on: posture, muscle activation, sensory feedback from the body, sensory feedback from the environment, cognitive interference, spatial processing and navigation, etcetera… An awful lot more is happening that just sitting on the couch! This can cause an overload of the neural structures that have to process the information. Hence it is interpreted as ‘unpleasant’ by those unaccustomed to momentum sports. People beginning sport often make subconscious efforts to reduce cognitive load by exercising indoor, listening to music, exercising at a reduced intensity, picking exercise modalities which minimize the amount of, or disassociating themselves from the activity at hand by using distraction techniques, such as counting strides, singing, thinking about something else. With practice a person develops automatic ‘coping mechanisms’ (schema) where things that would normally take up their attentional resources become automatic. So which is ‘less stressful’ I am not aware of a comparison between exercise modality and rate of arousal (although it probably has been done), so have to go on common sense here. I would guess running causes a greater amount intrinsic stimuli while cycling causes a greater amount of stimuli from the environment. In colloquial: Running hurts more than biking, but the movement is slower, so you have less things like cars, obstacles, dogs and potholes to deal with, biking is more stressful due to environmental factors. Given rates of participation in sport I’d guess about the same as cycling and running have a very similar amount of participants. Coming next we’ll get Ricardo to throw swimming into the equation. Nilsson, J. and Thorstensson, A. (1989) ‘Ground reaction forces at different speeds of human walking and running.’ Scandinavian Physiological Society, 136(2) pp. 217-227. Scott, C. B., Littlefield, N. D., Chason, J. D., Bunker, M. P., Asselin, E. M. (2006) ‘Differences in oxygen uptake but equivalent energy expenditure between a brief bout of cycling and running’ Nutrition and Metabolism, 3(1). Keytel, L. R., Goedecke, J. H., Noakes, T. D., Hiiloskorpi. H., Laukkane, R., van der Merwe, L., Lambert, E. V. (2005) ‘Prediction of energy expenditure from heart rate monitoring during submaximal exercise.’ Sports Science, 23(3) pp. 289-97. Ekkekakis, P. and Petruzello S. J. (1999) ‘Acute Aerobic Excercise and Affect.’ Sports Medicine, 28(5) pp. 337-347.
anxiety performance relationship.’ International Review of Sport and Exercise Psychology, 1(2) pp. 184-201. Derakshan, N. and Eysenck, M. W. (2009) ‘Anxiety, Processing Efficiency and Cognitive Performance. New Developments from Attentional Control Theory.’ European Psychologist, 14(2) pp. 168-176. Okay, so I’m working backwards this year and will be ‘peaking’ in December… But for most people NOW is the start of the off-season. I’ll take a couple of weeks of over Christmas ;-). It’s the ‘rest period’ in the ‘macro-cycle’ that is the season. The main benefits however are mental. If you’ve been at something for months on end, it’s good to it a break. A couple of weeks seems like an eternity not to train but in actual fact it’s just enough time to freshen up for the following year. Physically, there are also important considerations: including strengthening the body, replacing depleted nutrients and broader rest period to recover from 10-11 months of non-stop training. Note that far from being a period of no training (although a week or two is in most cases a good thing) this period is actually characterized by doing a number of different activities to bolster recovery, rest and rebuilding. Cycling (road cycling specifically) reduces bone and so activities that result in ‘osteogenesis’ -that’s bone development become important. These activities are those that involve weight bearing and ‘impact’ activities. So running, gym, field sport and mountain biking. I’m not sure how acute the reduction in bone mineral density is in semi-serious or recreational cyclists, however it’s at least equivalent to sedentary people. Other benefits come from training movements you’re not used to, for example field sports require power and changes of direction and a series of eccentric movements you simply don’t find in cycling. So ligaments and supporting structures are also strengthened through these activities. So in a nutshell, it’s strength and bodily integrity with which to face the season that we are building. Mountain biking can be a great way to develop bike handling skills, specifically ‘vision’ control and balance over the bike. Because the ‘relative speed’ (speed relative to your environment). Riding single track at 25 kph can feel like you’re flying along, however the speed is actually low and you’re not that likely to hurt yourself should you come a cropper. Mountain biking is good too, because there’s little or no cogitative interference in the acquisition of these skills: What this means is you just ‘do it’ rather than think at all about what your doing. The more you think about something, the more you distract your subconscious brain from the important things like getting out the way of that tree your cycling towards! Mountain biking helped sort out my bike handling back in the day. Thanks to my team mates for encouraging me and teaching me! Going to the pool a little bit de-trained will expose flaws and weaknesses in your technique, so it’s a good point to see whether you’re going wrong (video analysis and a good coach work great), then build it up. There’s an order of priority for building an effective swim stroke, essentially you work on position (balance, kick), hand entry (important not to develop injury), catch (‘grabbing’ the water), pull (pulling yourself through the water), rotation (rotating your shoulder to about 45º on the entry) and recovery… I’m no expert. But if you have any question on it, get in touch and I’ll put you in touch with Ricardo. be patient with rest periods. Endurance athlete have an absolute hatred of ‘staying still’ and rest: Just do it. It as important as training. Endurance athletes also have an absolute hatred of the gym and other forms of cross training and frankly I can’t blame them. If you’re used to the outdoor and the pleasure it is to run or cycle through the world, and the ‘fix’ that these sports provide, obviously being stuck in a room under artificial light with a bunch of meat heads eyeing each other up is going to be nothing short of miserable. However, big improvements can be found by building up your strength in the gym and then maintaining your strength gains through the season with just a couple of weekly sessions. So rather than fear the weight gain, think of the greater (eventual) power at threshold and sub-maximal economy that a strength training phase will afford you. 4-6 weeks (this can vary a lot) strength training. Other activities running concurrently: walking, hiking, field sports (with obvious care). Specific sports usually come in a small way about 2 weeks in. ‘Baseline’ evaluation for specific training –absolutely key to make the off-season training objective and effective. 4-8 weeks begin ‘proper training’: Long slow distance to begin within, or neuro-muscular, anaerobic capacity and some aerobic capacity depending what your training strategy is and what your training goals are. ‘Fit’ evaluation for the last touch ups on training before even more specific training. While there have been pioneering researchers who have found these alternative forms of training to be better than the ‘tried and tested’ methods, people are surprisingly slow making the switch. What I’d say is that neither rest, strength training or cross-training are anything but bad for you! What’s more, training is a gave of averages and ‘marginal gains’ so that while the benefits might not turn you into superman next season, they’ll certainly be there; there are no miracles, just hard work. Mike Schultz on training peaks has a good piece on weight training: http://home.trainingpeaks.com/blog/article/year-round-strength-training-for-cyclists Don’t need much more than that although different coaches will coach this differently. Arnstein, S., Øyvind, S., Marius, B., Morten, L., Jan, H. and Jan, H. (2010) ‘Maximal Strength Training Improves Cycling Economy in Competitive Cyclists’, Journal of Strength and Conditioning Research, 24(8) pp. 2157-2165. Warner, S. E., Shaw, J. M. and Dalsky G. P. (2003) ‘Bone Mineral Density of Competitive Male Mountain and Road Cyclists’, Bone, 30(1) pp. 281-286. Zupan, M. and Petosa, S. (1995) ‘Aerobic and Resistance Cross-Training for Peak Triathlon Performance’, Strength and Conditioning, 17(5) pp. 7-12. In open water swimming sighting techniques make up a core skill no swimmer or triathlete can do with out. Much has been said about navigation in open water swimming, but as you have probably noticed, no two situations are the same. 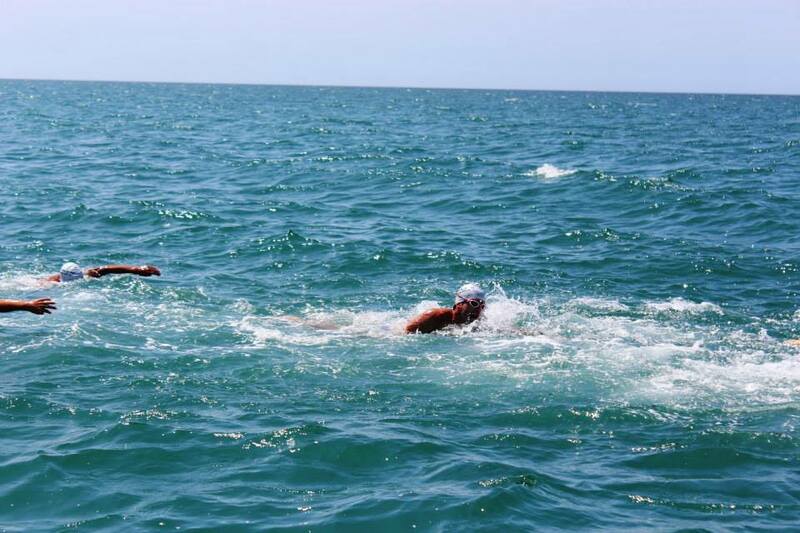 Regardless, there are a number of useful tips that apply across all situations so that you can go quicker to the the first buoy, T1 or even the finish by swimming in a straight line and not in a zig-zag. Swimming in a straight line is the most important aspect. 1- The shortest distance is a straight line, so, we have to maintain it! Some people have a tendency to breath off one side only. Change that, breath off both sides, of every third stroke till your swimming symmetrically and your technique is stable. Take a “peak” at the buoy or finish every 10 or 15 strokes. Do not trust those swimming alongside you, they are just as likely to get it wrong. I occasionally make this mistake, just occasionally! You can’t navigate using the sea floor (like in a pool). So you have to spot the buoy frequently. 2- Use the wind or the tides to your favour. Like in a boat, the captain uses the wind to make corrections on the direction of its ship, you should do the same. If the “weather” is pulling on to the left we have to make the correction that we want to make a straight line. I.e. if there’s a cross current from the left, you’re going to need to aim for a point further to the left of the buoy so that the current ‘carries’ you in. As you can imagine, you’re not swimming in a straight line, but rather a curve (because of the movement of the sea). In this situation at a start, it’s best to start on the same side as the current, so that fewer people drift across your line and upset your rhythm. You have to swim differently light conditions. Train at different times of day and in different light conditions. The reflexion of the sun on the water (still water especially) can make sighting very challenging. Because of this I finally gave in and got polarized goggles; they are not mirrored, only shaded and if you are not going to be swimming backstroke, or looking in to the sun, no stress. Loads of people asks me how to survive against the “fog” inside the goggles ? Easy, I rinse them in water , and before the open eater session a little bit of spit and a small rub inside almost all the times, although, the important part is that you must avoid putting any kind of grease, (from the skin, balms, Vaseline (triathletes ) sun block etc) inside the goggles. The buoy isn’t the only ‘pointer’ to keep you on track.. Rocks, buildings, or even a boat that is anchored, can be good alternatives to follow to keep you on track, as these larger object can be easier to spot. But don´t use just one, use a couple. On race day, go to the last buoy or last turn and try to understand the direction of the Finish line / T1, and the previous buoy and get an idea of objects you can use for sighting. This trick is particularly useful in heavy seas. The best way to overcome a heavy sea, is to try and swim at different times of day. Try to purposefully to train in choppy seas of the afternoon onshore wind. It will not be the same as swimming in a storm (we’re not suggesting you swim in dangerous conditions) but, believe me, it´s quite hard sight correctly on a day were the wind is causing a small wave pattern of only a 30 or 50 cm. So, don´t start to swim in the winter storms, just swim in different places, and in other hours of your day.